Actual events in the past resulted in the present. What we think, now, about those events in the past or what stories we tell, now, about the past are of no consequence to the present (no matter how fascinating or revisionist those stories may be). The consequences of past events reverberate into the future until their influence has reduced so as to be submerged into the background noise. Say it actually was an asteroid impact 65 million years ago which led to the mass extinction of large dinosaurs (even if some survive as birds today). The reverberations of that asteroid impact can no longer be definitively detected. It can still be inferred by other events but all direct consequences are now part of the background noise. We can imagine other alternative histories. It might have been a super-volcano eruption – the detectable impacts of which would now also be lost in the noise – which caused the decline of the dinosaurs. Large dinosaurs may have disappeared catastrophically over a very short period or dwindled gradually over a few million years. We can imagine any story we like as long as its effects are now lost within the background. The super-volcano eruption and the asteroid impact are equally real (or equally imaginary). Is reality confined to the present? A real event that occurred yesterday is not real now. If everything not-real is imaginary then everything in history is imaginary now. Events that did occur are imaginary in the now. But events that did not occur are also imaginary. For events from as close as yesterday there may be collateral evidence to support one particular imaginary reality that was. For recent events some imaginary reality may be more real than another. But for events from the more distant past all the supporting evidence may be buried within the background rumble from the past. Then all imaginary realities are equal on the reality scale of imaginary realities. But the “real” reality must be causally connected to the present and so must also be the realities of the future. Clearly time has an impact on reality. Perhaps it is wrong to thing of reality by itself and we need to think instead of the space within which reality can exist and the reality time-line. 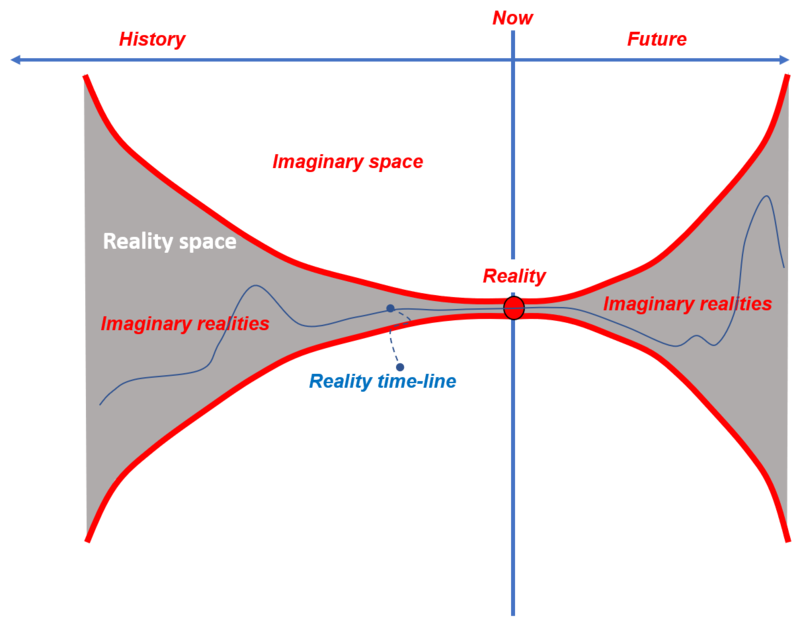 The reality space is the space of causality. Perhaps reality has to have a time axis. From the now, past or future realities (which are imaginary in the now) are time-lines which can only exist in the reality space. The reality time-line then must be capable of being causally connected within the reality space and must pass through the now. The imaginary space is then that where events cannot be causally connected to the present. That dinosaurs have become chickens lies within the reality space that we can discern now and is an imagined reality. That dinosaurs became tigers lies in the imaginary space but cannot be causally linked and, therefore, is not even an imaginary reality. This entry was posted on July 12, 2018 at 8:24 am and is filed under History, Philosophy. You can follow any responses to this entry through the RSS 2.0 feed. Both comments and pings are currently closed.